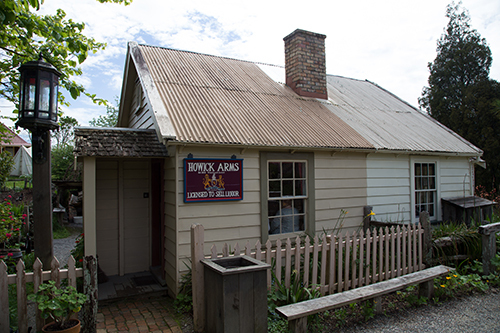 The purpose of this article is to provide information about the Howick Arms, and the brewing and bottling of beer in the early days of New Zealand colonial settlement. The Howick Arms was selling liquor in Auckland at the same time the Halfway House was providing shelter and liquor for travellers along the Porirua Road in Wellington. By studying the Howick Arms, we get an appreciation on how things may have functioned in the early days of the Halfway House. 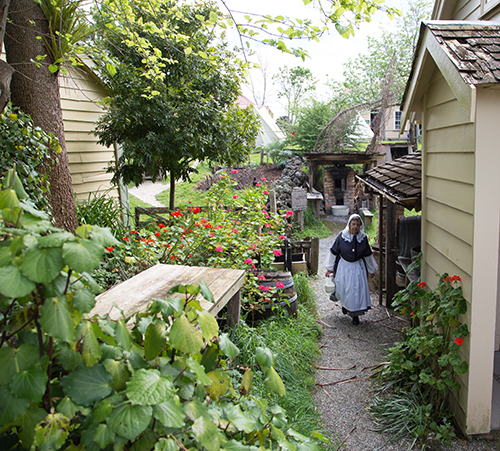 Today the Howick Arms is located in the Howick Historic Village, a village that replicates New Zealand colonial life from 1840-1865 using authentic buildings and artefacts. 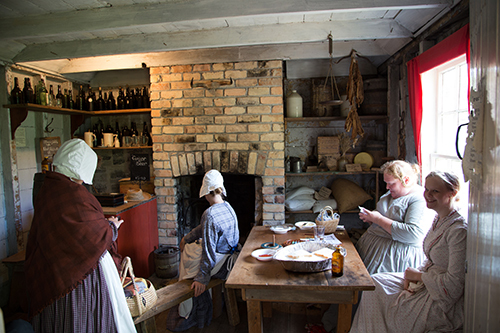 Many of the volunteers are descendants of the original settlers. 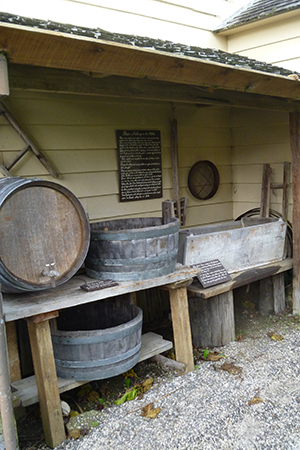 The earliest reference to liquor being provided at The Halfway, was referenced by Barbara and Robin Kay in their book Anthony Wall, Settler of Porirua: The Papakowhai Story (1996). Their research is that in 1842 John Lodge was issued with a bush licence for the sale of liquor until 1845, at which time the bush licence was then held by Anthony Wall. In 1848, in Howick, Auckland, Owen Lynch applied for and received a licence to sell spirituous liquors. The front part of Owen Lynch’s house, The Howick Arms, was open to the public and supplied liquor. The back part of the house was private quarters. The other half of the cottage is a general store and post office, which was lived in and managed by another family. In the 1850’s, the hours of opening for the Howick Arms were six o clock in the morning until ten o clock in the evening during workdays. On Sundays, Good Friday and Christmas Day, the hours of opening were one o clock in the afternoon until seven o clock in the evening. Beer was made through the process of boiling water, which killed any germs in the water supply. It was considered refreshing and had a low alcohol content. 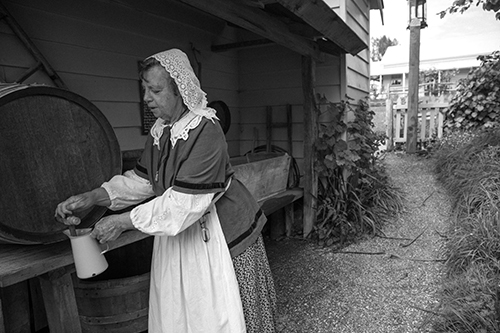 In the 1840’s beer was imported into New Zealand in stone bottles and in the 1850’s, in dark glass bottles. There was a penny customs tax per bottle. Bottles were reused with new paper labels. For a time from 1847, it was forbidden to sell beer or spirits to Maori in case they sold their land whilst intoxicated. Owen Lynch, who could not read or write, became one of the richest men in Howick selling beer and spirits. In the foreground is the brick framed copper, in which the liquor was boiled. The New Zealand Journal, dated Saturday, June 25th, 1842 advertised - “The Private Brewer’s Guide to the Art of Brewing Ale and Porter” which was “particularly adapted to the use of families of the nobility, gentry, farmers, and private brewers etc.” This private brewer’s guide was written by John Tuck of England in 1822. These days, it can be accessed to read on the internet. All beer equipment must be absolutely clean before use for brewing. This is to prevent poor smell and bad taste. Beer is made by boiling water in the copper. Barley grain is added to the water, and boiled to form a mash. This process, called “mashing” extracts sugars from the barley. The liquid drawn off this, is called wort. Each stage of the brewing process results in a refining of the product, producing a different quality of wort. The drawn off liquid (wort) is heated in the copper with a canvas bag of dried hop flowers and stirred and cooked. The wort is drawn off for cooling in a vat. 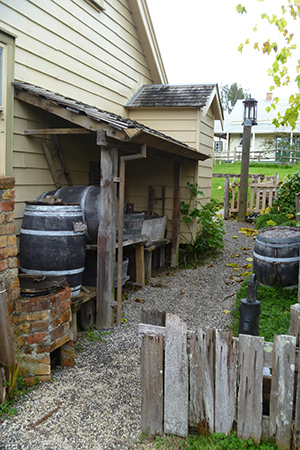 A vat was preferred over a tub, as a tub was often used for private washing purposes and this could taint the liquor. The next stage is fermenting, in which the liquor is cooked at an even temperature, with yeast and salt added. The final stage is cleansing, in which the yeast is separated off and the liquor poured into bottles or barrels. From right: The vat, which was used for holding the mash or cooking the wort. The mash tub, which was used to hold ground malt (of germinated barley or wheat) and water producing an infusion of sweet wort. A second tub, which could be used to cool the beer for fermentation, prior to bottling. The barrel, in which the liquor was stored.